This page has been created with your safety in mind. It is important to us that your trip be as safe as possible. In order to help us care for your safety, we are providing you with some rules and tips for operating a motocycle in the tunnel. 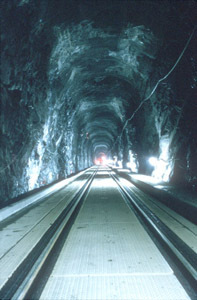 Due to overhead rock and the enclosed tunnel environment, helmets are required for the operator and any passengers. Motorcycles pulling trailers with tires less 3.5 inches in width are not recommended to use the tunnel. Motorcycles pulling trailers through tunnel with tire widths less than 3.5 inches risk contact with the rail. Motorcycles will be released at the end of the sheduled opening, a minute and a half behind other traffic. There will be no other vehicles, except motorcycles in the tunnel. 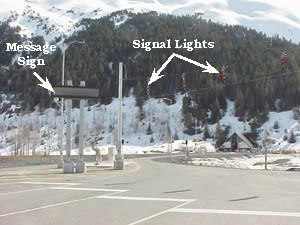 Motorcycle should use lane 8 in the Whittier Staging Area, unless otherwise directed by traffic control. Wait for the traffic control light in your lane to turn green before proceeding. Cross the rail at an angle, ride only between the rails, and avoid any contact with the rails. 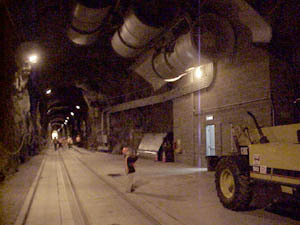 Maintain 25 MPH throughout the tunnel. Ride in single file. Attempts to ride side by side will result in contact with the rail. Maintain 100 feet of separation between motorcycles. Avoid weaving. Weaving increases the chance of contact with the rail. In order to safely navigate the tunnel it is necessary to be alert and look out in front of you. To help you, we have provided a few things to look for as you travel. Watch for the placement and location of your tires. Make certain they are not close to the rail. Look for debris on the road surface. Be wary of target fixation that can occur when you focus at the end of the tunnel. Keep your eyes moving. Watch for other riders, especially those that look like they may be uncomfortable. The concrete road surface is often wet, avoid sharp or quick movements. 1600 feet from each end of the tunnel at safe-house 1 and safe-house 8, you may encounter wind turbulence from the jets fans. Stay calm, you are on camera and help will be with you as soon as traffic in front of you has exited the tunnel. If you are able to reach one of the emergency phones, pick up the phone and the answering operator will assist you. Please inform the operator of any injuries or medical conditions. Do not try and move the motorcycle by yourself, wait for help to arrive. If you are injured do not try to move. Help is on the way. Have any injuries examined immediately. Even scatches or bruises could be signs of a more serious problem that requires greater medical attention. A copy of the Motorcycle Safety Information brochure, including the Summer Tunnel Schedule, may be printed or downloaded below. If you have any questions, please contact the manager at the address found on this site.